From the author of The ROI of Memebrship-Today's Missing Link for Explosive Growth...learn how to calculate and communicate your organization's real-dollar ROI of membership. To recruit new members, associations and societies must first see their organization through the eyes of the non-member and then prove that membership is a good business decision through demonstrating the ROI of membership. Resulting from his two decades of working with associations and societies, Ed has developed and continually improves his unique active qualitative research method, Rigsbee Member ROI Valuation Process for determining the yearly sustainable real-dollar value of membership. Rather than arm-twisting selling, Ed advocates an organic grass roots "member-get-a-member" approach to membership recruitment and retention. Let Ed help you to prove to members and non-members alike that membership in your organization is a good business decision. For strategic alliance ROI, relationship ROI, or (association & Society) member ROI, you will want Ed Rigsbee for your next meeting. He is one of America 's most prolific authors on the subject of business growth through Strategic Alliances, Ed is a consultant and advisor to world class clients such as Toyota , 3M, Dun & Bradstreet, BE Aerospace, George Fischer Signet, Mead, Siemens, Roland, Best Buy, and others. He travels internationally to assist organizations in building alliance relationships and to improve their total effectiveness and profitability. When he takes the platform to deliver his keynote presentation, or multi-day programs, he delivers twice the value. First is his high level content, gleaned from his three books and over 2,000 published articles. Second is his naturally playful and humorous manner which he uses to relax and disarm his audience members. The result from this combined delivery design is his distinctive ability to move people into action; to do better and be more effective in business and life. Ed holds membership with the Association for Strategic Alliance Professionals. Hosted Hospitality-Planner summits are quickly replacing expos for hotel business development. Planners also find this targeted approach more time effective. At this type of event, Ed blends his partnering expertise with his meeting planning experience. He understands both sides of the planner-hotel alliance challenge. Ed has presented at PCMA, MPI, Affordable Meetings, several state SAEs, and various other events for meeting executives and planners. When hospitality wants to partner with meetings organizers, they call Ed. Business and Life are About Results, Not Excuses! Ed is the president of Rigsbee Research in Thousand Oaks, California, a division of Rigsbee Enterprises, Inc., founded in 1981. Ed has been an adjunct professor for both the Universities of California at Santa Barbara and California Lutheran University. From the business perspective, Ed brings extensive strategic management, marketing, and sales expertise to the platform. He has real-world experience to share. His work experience ranges from retail and sales management positions in his twenties, as president and owner of a manufacturer representative firm in his thirties. 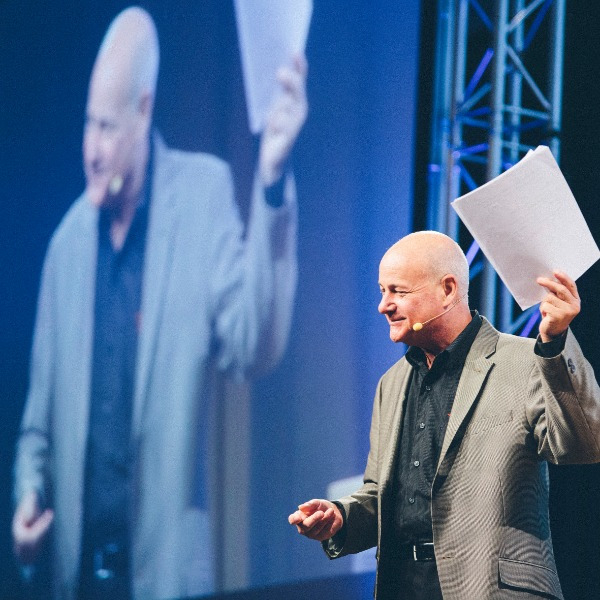 Today, Ed is an internationally published author and recognized professional speaker. Throughout his career partnering has been his standard method of operation. His presentations, based on his mutually beneficial partnering philosophy have evolved through years of research and teaching management, marketing, and selling skills. Ed's work has earned him favor with corporations and national associations throughout North America. Besides his speaking, writing and consulting activities, Ed and his wife Regina have two sons, Ryan and Jonathan. They have been married since 1974 (making the point that he is successful in relationship nuturing). Ed, enjoys snow skiing and is certified with NAUI Worldwide as a Master Scuba Diver. Ed has been an active member of the National Speakers Association (NSA) since 1988 and holds the Certified Speaking Professional (CSP) designation. Another area in which Ed thrives is in serving non-profits, trade asscoiations, and professional societies. He is an expert in member recruitment and retention campaigns. Additionally, he is the founder and serves as executive director, at Cigar PEG, Inc., a California incorporated, non-profit public charity, recognized by the IRS under 501 (c) (3) of the tax code. Through its educational institute, this organization focuses on providing small business, entrepreneur, and capitalism education. Ed holds membership at ASAE & The Center for Association Leadership and received their Certified Association Executive credential in 2012. Ed Rigsbee best serves audiences in the AM with general session presentations. Alliance building is a great way to kick off any meeting. Ed does not present during meals.